Exploring the glorious Red Fort of Agra | Where to next? Agra and its surrounds are a major destination for tourists visiting India, with three sites that belong at the top of the must-see list. For starters, there’s the magnificent white marble Taj Mahal, just up the road is the impressive ‘ghost town’ of Fatehpur Sikri, and finally comes the Red Fort of Agra. Poor John and I first visited the Taj Mahal in the early 1980s, but we have absolutely no memory of visiting the other two places. It’s good I didn’t know what we missed back then or I might have been crabby all these years. This time round, the fort was our third stop of the day. We arrived soon after a late lunch at a restaurant with white tablecloths, fancy cutlery, high prices and food nowhere near as good as we had been getting at various holes-in-the-wall. But the fort more than made up for the so-so meal. The place is ginormous. In fact, its overwhelming size was the main reminder to Poor John and me that we’d never been there before. How could we not remember this massive structure of red sandstone and other impressive buildings? With 94 acres enclosed by 2.5 kilometres of exterior walls, this powerful fortress was the imperial city of the Mughal rulers and is considered the most important fort in all of India. Not surprisingly, it’s filled with fairy-tale palaces, large audience halls and reception rooms, open-air courtyards and two mosques. It has a semi-circular layout and is surrounded by a moat. Emperor Akbar founded the fort in the mid-16th century on the right bank of the Yamuna River. It’s on the northwest extremity of the gardens that surround the Taj. Like the Delhi Fort (which we’ll visit later), the Agra Fort displays the grandeur of the Mughals under the reigns of emperors Akbar, Jahangir (sometime spelt Jehangir) and Shan Jahan. While the fort has two gates, today’s visitors must enter through the Amar Singh Gate, also known as the Lahore Gate and originally as the Akbar Gate. There were two more gates that have been bricked up. Even though I went through the main gate, I’m still not sure how many parts it actually has because we went through a series of magnificent and highly decorated openings, so the gate may be more than one structure. I’ve grouped the entry photos above and hope that maybe someone else can explain what’s what. That said, from the moment I actually entered the fort, I was struck by its beauty, craftsmanship, detail, views and magnitude. Ancient records show that as many as 500 buildings were constructed within the fort. Shan Jahan demolished some so he could build marble structures, but the British destroyed many in the 1800s to make room for their military barracks. Today about 30 marble and sandstone structures survive. Jahangir Mahal is the biggie that caught my eye from the outset. Considered the most notable building still standing, the palace was the domain of royal women, especially the Rajput wives of Emperor Akbar. I’ve tried to find details about just how big this palace is, but no luck so far. A huge bowl sits in front of women’s palace. Known as Hauz-i-Jahangiri, this bowl was carved from a single piece of stone, and used for bathing and holding fragrant rose water. I did find some statistics about it—on a marble plaque placed beside the bowl itself. Jahangiri had the bowl created in 1610. It measures five feet high, eight feet in diameter and 25 feet in circumference at the rim. There are stairs inside and out, along with 10 carved cartouches on the outer rim. It also has five couplets, of which two are still readable. Luckily these two give the bowl’s name and its date of construction. Khas Mahal is a second white marble palace. 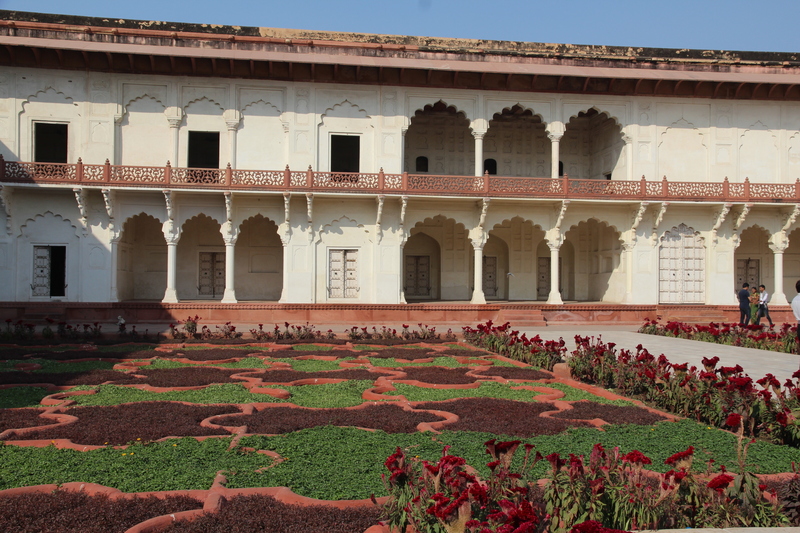 It overlooks the river on one side and the extensive and lush geometric Anguri Bagh (gardens) on the other. Shah Jahan had the palace started in 1631 for his daughters, Jahanara and Roshanara. 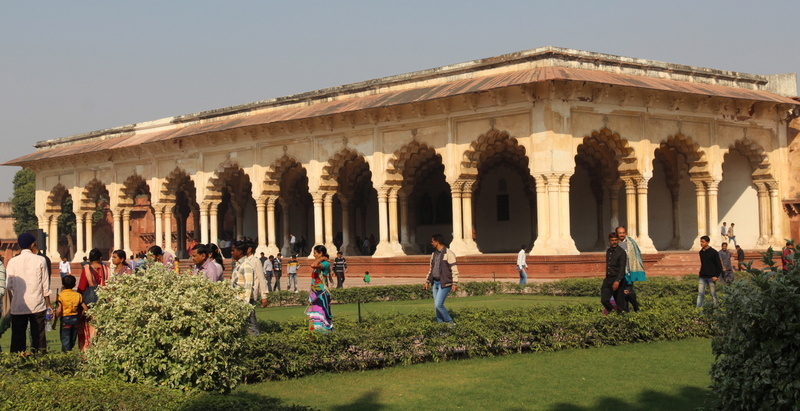 There are two almost identical pavilions either side of the Khas Mahal’s central hall. 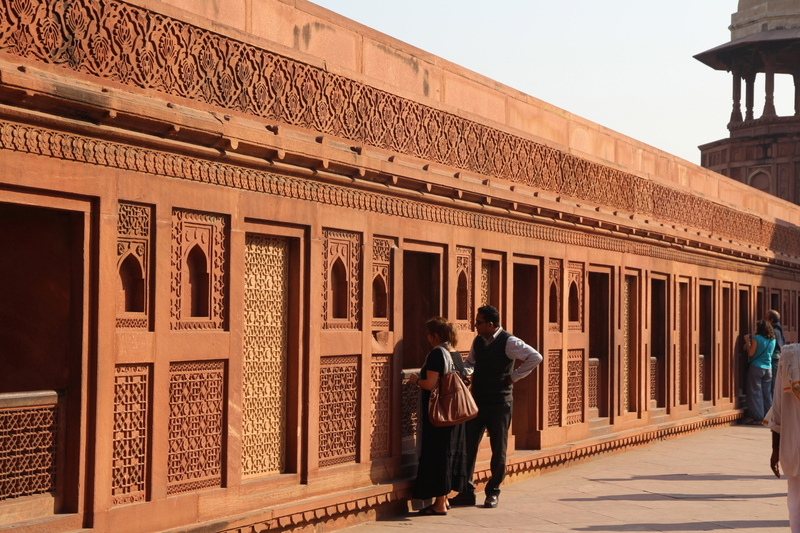 These red sandstone structures have been plastered with white shell plaster and have some gold work in their mural paintings. The interiors are profusely decorated with floral and geometrical patterns. Another impressive white marble structure is the Diwan-i-Am or Hall of Audience. It was where aristocracy and the public met and communicated. It once housed the fabulous peacock throne. Then there is the private audience hall—the Diwan-i-Khas—where kings and other dignitaries were welcomed. Amazingly, I don’t seem to have a single pic of the hall, although I remember it clearly. Here are some pics by others. But the most poignant building has to be the Musamman Burj, a large octagonal tower. Emperor Akbar had it built in 1632 as a place where he could give his daily public address, jharokha darshan, as he carried out his sun worship. It is said that he governed the whole country from the balcony, which faces the Taj Mahal. The sadness comes with Shah Jahan, who built the Taj. His son, Aurangzeb, imprisoned his father in the Musamman Burj. You have to give those Mughal kids credit for being ruthless to kith and kin. Shah Jahan spent the last eight years of his life there, gazing at the tomb of his beloved and departed wife. Heartbreaking, but at least he was in luxurious surroundings. When he died, his body was taken to the Taj by boat and buried. Unfortunately the public is not allowed to enter the Musamman Burj. I’m so glad we got to the fort this visit. Frankly, I would be happy to visit again and again and again. It’s that good. UNESCO feels the same way. In 1983—two years after my first visit to Agra—they declared the fort a world heritage site. I’ll finish off this post by sharing some images of the sandstone and other carved parts of the fort. I admit that I can’t accurately identify all the locations, but I love the architecture and designs. And I’d love it if you’d take a moment to check out my cooking blog. Very nicely covered, Peggy. I remember learning about the Lahore Gate however I do not remember learning about the size or importance of this fort. I like you and PJ am surprised that I don’t remember more about such an impressive structure! Wow! I knew Shah Jahan was made to view the Taj Mahal for the remainder of his days from afar however I thought it was a figure of speech rather than he actually was made to gaze upon his wife’s tomb, how sad. Imagine had his son been able to follow through and build the mirror of the Taj Mahal across the river only in black marble what an incredible picture that would be beyond what is now! Your detail provided by your camera and great photography skills is a real treat, thank you. I think a lot of pictures would not reflect the beauty of that carved sandstone. Dave, I’m impressed that you remember so much detail about Shah Jahan, this fort and the Taj. You must have done a school project on India (while I did one on France), or you had a teacher with wonderful and broad knowledge and interests! It is breathtaking Peggy and you talk about it so well! Thanks Lesley. I admit that it’s easier to write about something so inspiring. If anyone takes the time to go see the Taj Mahal… then without a question they should be going to the Red Fort of Agra… very impressive architecture and great photos, commentary. I do recall when visiting the Taj Mahal, that I did go across the river to another site. And I believe it was called the Baby/Little Taj? 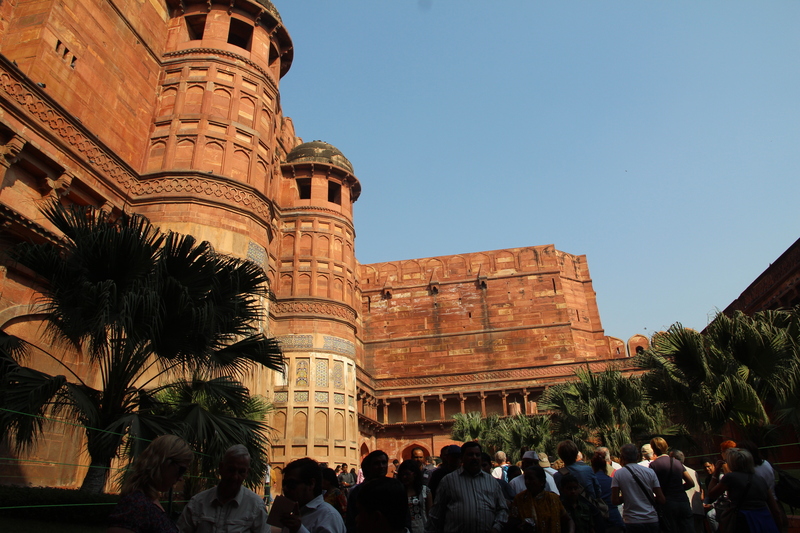 However, I do not know if I was at the Red Fort… but some how in my memory I recall red sandstone structures and looking down in an amphitheater of some kind? There is a Poor Man’s Taj called Bibi Ka Maqbara, which may be where the words Baby Taj come from. Shah Jahan’s son, Aurangzeb, had it built to honour his first wife. It’s not in Agra, but it bears a remarkable resemblance to the main Taj. We didn’t get to see the second version. G’day Peggy, am still really enjoying your travels through your view! If I won’t be able to get to India in this lifetime, at least I feel like through you I have, true! Thanks Joanne. So glad you are along for the ‘ride’. That fort is truly amazing! The red of the sandstone, the different marble buildings and your photos, as always, are stunning. It’s almost like being there. Thank you so much. You are most welcome. The contrast of colours with the sandstone and marble is wonderful. 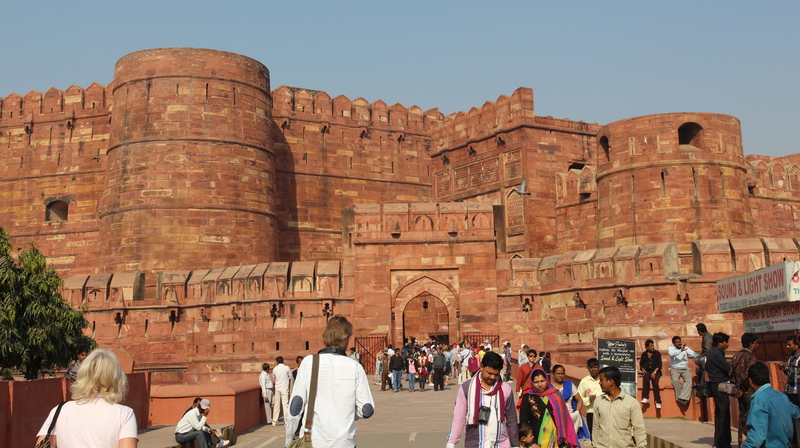 Hi Peggy… You explained about red fort and its history very nicely.. I’m really impressed by your blog and pictures. we would love to show you India again. Thanks. I’m hoping to see more of India later this year…with you! 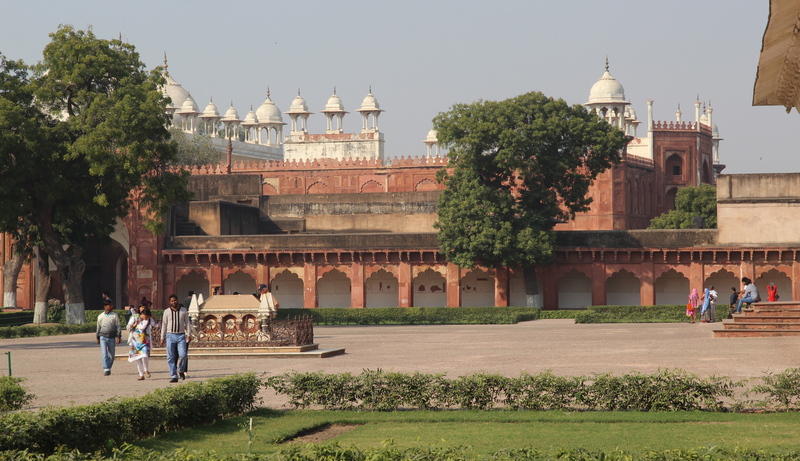 A program on india was shown on English tv the other night the red fort was mentioned. It reminded me of this post. I was impressed at it’s importance so have returned to take another peek at your lovely photographs. The plums and peaches are finished this year, but the figs are ripening nicely. This is what I did with some of the peaches. Dazzled by the splendour of the Taj Mahal | Where to next?